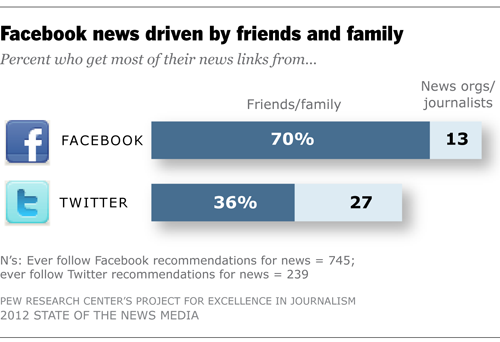 At the moment, Facebook and, to a lesser extent, Twitter, dominate this intersection of social media and news. As written about in detail in the Digital chapter of this report, eMarketer reports that Facebook had 133 million active users in the U.S. at the end of 2011. Facebook defines “active users” as those who interact with Facebook content at least once a month. Despite debates about defining “active users,” there is little question about the site’s popularity or its “stickiness,” the degree to which some users are there a lot: Facebook users spent an average of 423 minutes each on the site in December. By contrast, a PEJ analysis of Nielsen Net View data puts the average time on a top 25 news site at just under 12 minutes per month. Even in 2010, all but one of those top news sites, with the exception being Google News, obtained a portion of their traffic from Facebook. And in 2011, Facebook furthered the news element of its platform with developments like the Social Reader, which allows users to follow, read and share news without ever leaving the network. How much are consumers relying on Facebook for their daily news information, especially in comparison with using search or going directly to news websites or apps? And when they do get news on these networks, does it come from friends and family or from news organizations they follow? And finally, how is this news viewed?